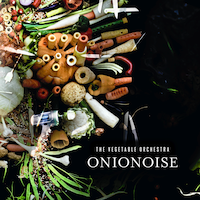 ONIONOISE is the third CD by The Vegetable Orchestra, an ensemble unique to the world of music which is committed to the exploration of the acoustic qualities of vegetables. In addition to performing on the international concert circuit, the 12-people collective from Vienna has spent the last dozen years experimenting with the building of vegetable instruments, industriously unearthing the acoustic universe of roots and legumes, cabbages and courgettes. The sounds produced by the vegetable instruments are amazingly multi-layered: transparent & crackling, shrill & massive, dark & hypnotic, funky & groovy – a heterogeneous multitude of acoustic gems and strange, unfamiliar sounds whose organic origin is not always immediately recognizable. The compositions are tailored to suit the specific characteristics of the vegetable instruments being used, in terms of their sonic attributes and practical considerations to optimize performance. Stylistically the music oscillates between organic pop music and aural sound experiments, with inspiration from various sources: Minimal Techno, Ambient, Noise, Pop, New and Electro-Acoustic Music. One important characteristic of the orchestra is its collaborative self-organization. Every aspect of the CD (from compositions, photographs, cover design, to label and distribution) has been developed and decided collectively by all members of the ensemble. This CD is an aural voyage through phantasmagorical continents of sound and imaginary gardens. Living music: multi-layered and idiosyncratic. The elaborate Digi-Pack also includes a poster. "what makes the music more than just a curiousity, however, is the fact that even if the instruments weren't so unusual, the funky grooves they conjure and the hauting wisps of melody stand up on their own. The fact that these sounds couldn't be made in any other way just amplifies the accomplishment of such beauty." "Vienna, Austria is one of the great musical cities of the world. It's been home to Beethoven and Schubert, Mozart and Brahms. And now: the Vienna Vegetable Orchestra." "Vienna Vegetable Orchestra takes fresh approach to musical instruments"
"...the vegetable orchestra concocts sweet sounds..."
"...likely the world's only orchestra that handcrafts its own instruments before each concert..."
"Sie bedienen Plattenspieler mit Bohnenschoten, machen aus Karotten Flöten und zerschmettern in Jimi-Hendrix-Manier Kohlköpfe auf der Bühne. Der Sound dieses Gemüse-Orchesters ist einzigartig. [...] Mozart hätte an dieser neuen Wiener Schule wohl seine helle Freude gehabt."